The beauty of our new ranch is that every day there is a new adventure, ripe with new discoveries. This weekend Dillon found a most "wonderful round thing" while on a walk. He was immediately the envy of everyone else. 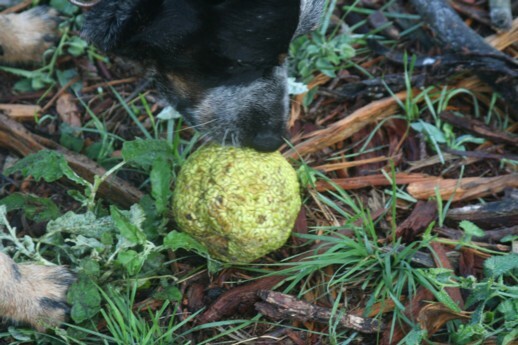 When I first saw this "thing" I thought Dillon had found an oversized tennis ball. This intrigued me because the ranch is remote and not the place one would expect to find a dog toy just hanging around. Here Ranger checks out the curious thing. Dillon brought it home and everyone played with "the thing" to the point where I had to hide it so it was relatively intact when I had local friends identify this curiosity. My friend, Kim, identified the oddity as a "bois d'art" or "horse-apple" and we drove off on the 4wheeler to find the tree. Then I came home to google the thing. I found lots of interesting stuff about it, but the most interesting (to ME!) was its use as an insect repellant similar to DEET. Really? Hmmm . . . I wish I had brought home this wonderful round thing so I could test this theory. You can bet your Grandma's best cast-iron skillet that I'll be putting one of these curious round things under the bed the next time I go to the ranch! 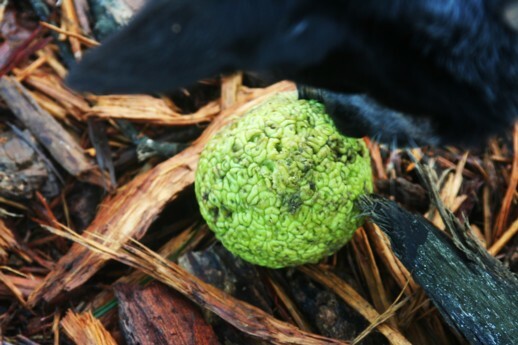 The trees are also known as Osage Oranges in other parts of the country and also have the reputation of being a mouse deterrent although I haven't tested that myself. Some places also refer to them as yew trees - the type they used to make bows from. They have a tough orange/red wood. They are hardy little trees and used for windbreaks in some areas. We have always called them mock oranges.. they are pretty common here in central Alabama. Never knew of their repellant uses though.. thanks for the info! The trees also have lovely long thorns on them, so watch the dogs for picking up dead branches to play fetch with. My Mom always made gum drop trees at Christmas for us to "graze" on and the bow d'arc branches with the long thorns were perfect. And of course, as far as "homemade" no Christmas or Thanksgiving table was complete without spray painting them gold and making candle holders out of them. Hedge balls or Hedge apples are what they are called in Kansas. According to a book Praire Wanderings, I learned that with their spines they were used as barbed fencing to control livestock. In 1867 Kansas farmers were paid to plant hedge fences. The wood is resistance to bacterial decay, and wood posts can outlast steel posts. An interesting tree and fun fruit! Here in Kentucky they are called Hedge Apples. The tree that this fruit comes from has extremely hard insect resistant wood. Harmless for puppies.